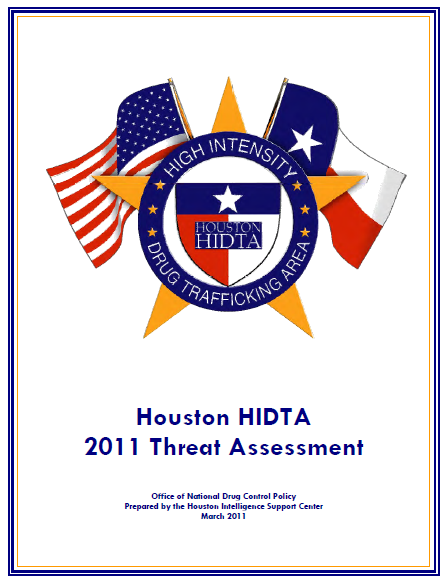 The intent of the Houston HIDTA Threat Assessment, produced by the Houston Intelligence Support Center (HISC), is to identify the potential impact of drug trafficking trends within the Houston HIDTA and to deliver accurate and timely strategic intelligence to assist law enforcement agencies in the development of drug enforcement strategies. The most significant trends identified in 2010 are provided in this Executive Summary. There was a slight increase in the number of DTOs identified by Houston HIDTA Initiatives, from 446 in 2009 to 461 DTOs in 2010. Of these, 45% operate on the local level. The other 55% have a broader scope with 18% operating on a multi-state level and 37% operating internationally. Mexican DTOs account for the majority of the identified drug trafficking organizations operating in the region. The Gulf Cartel and Los Zetas have the most prominent influence in the Houston HIDTA. Los Zetas and the Gulf Cartel began violently fighting over lucrative drug trafficking routes in the Mexican border cities of Matamoros, Reynosa, and Nuevo Laredo near South Texas in 2010. While the proximity of violence has moved closer to the Houston HIDTA region, the general consensus among survey respondents was that it has not significantly impacted the HIDTA. However, 40% of survey respondents within the Houston HIDTA did report an encounter with a member of a major cartel in 2010. Street gangs, prison gangs, and outlaw motorcycle gangs are present in the Houston HIDTA and many of these gangs continue to grow in membership throughout the region. Gangs play an integral role in drug trafficking and closer relationships between street gangs and prison gangs, and some prison gangs and Mexican drug cartels have increased the drug trafficking threat posed by gangs. Overland transportation methods are predominant for drug trafficking activities. Houston HIDTA Initiatives reported that drug loads coming through the region are now considerably smaller and that rural ranch roads are being used more frequently to avoid the checkpoints. Bulk cash smuggling remains the primary method of moving illicit funds, but three other methods have now gained prominence due to a new Mexico banking law restricting the amount of U.S. cash that is accepted. These methods include the Black Market Peso Exchange, a new form of the hawala system called “Espejo” and an increase in the use of wire transfers. Marijuana was identified as the greatest drug threat by survey respondents. The prevalence of indoor marijuana production has escalated within the Houston Metropolitan Area. Drug traffickers operating marijuana grow houses are aware that they face minimal penalties under current Texas law and are taking advantage of this loophole. New and emerging trends include the widespread popularity of synthetic marijuana, and the shipment of medical marijuana into Houston and Corpus Christi for illegal street sale. Cocaine was reported to be the drug trafficked most frequently by DTOs identified by the Houston HIDTA Initiatives in 2010. Both powder and crack cocaine continue to pose a high level of threat, although powder cocaine has fallen from its long-held position as the greatest drug threat by survey respondents. Pharmaceutical abuse is one of the most significant threats impacting the Houston HIDTA and further Texas legislation is needed to assist law enforcement to address the unique challenges posed by diversion. Now that pain management clinics are required to be owned by doctors, a new trend of drug dealers purchasing pharmacies has emerged. Other trends include an increase in promethazine and codeine being transported into the Houston area and a possible emerging trend of counterfeit production of hydrocodone in Houston. Methamphetamine poses a moderate threat to the region. “Ice” from Mexico is the predominant type found, but domestic production of methamphetamine is still occurring and poses a public health and environmental threat in some areas, most significantly in Victoria County. The threat from other drugs such as heroin, ecstasy, steroids, and other dangerous drugs are significantly lower than the level of threat posed by marijuana, cocaine, controlled prescription drugs, and methamphetamine within the Houston HIDTA region. This Executive Overview further expounds upon the trends identified in the Executive Summary for the reader seeking more specific information on 2010 trends within the Houston HIDTA in a short synopsis. The most detailed information is provided within the body of the Houston HIDTA Threat Assessment. The majority of the drug trafficking organizations operating in the Houston HIDTA are Mexican DTOs. The two most predominant Mexican cartels conducting drug trafficking activities in the region are the Gulf Cartel and Los Zetas, although other cartels such as La Familia and the Sinaloan Cartel also have a definite presence. Los Zetas and the Gulf Cartel began a violent battle for dominance over drug trafficking routes in northern Mexico in 2010. While the violence in Mexico was largely focused on areas such as Cuidad Juarez near the West Texasborder in 2009, the focal point of the conflict has shifted to the northern Mexican state of Tamaulipas that borders South Texas. In early 2010, Los Zetas and the Gulf Cartel began heavily fighting in the border cities of Matamoros, Reynosa, and Nuevo Laredo. Due to the high level of threat posed by Los Zetas, the Gulf Cartel has now formed an alliance with the Sinaloan and La Familia cartels against Los Zetas. There is a high threat level in Mexico, and Americans have been at risk there in 2010. There have also been some isolated instances of threat posed in the South Texas-Mexico border area. However, although the close proximity of the cartel violence to the Houston HIDTA region has been a concern, there has been no significant impact reported by Houston HIDTA survey respondents at this time. Instances of drug-related violence in Mexico near South Texas include an American citizen who was shot and killed by Los Zetas on the Mexican side of Falcon Lake, located along the South Texas border. He was apparently mistaken for a spy for the Gulf cartel. Most tragically, in early 2011, an ICE special agent originally from Brownsville was murdered by gunmen thought to be Los Zetas in the Mexican state of San Luis Potosi which borders Tamaulipas. This is the firs t time a federal agent has been killed by drug cartels in Mexico since 1985. Incidences of cartel violence in the United States along the South Texas border are minimal, but are of concern in the region. For instance, in Brownsville in September, two Los Zetas members were found executed. An investigation indicated that it was a hit ordered by the Gulf Cartel. In Starr County in October, border patrol agents were shot at from the Mexico side of the border. Most survey respondents reported that border violence had not yet significantly impacted the Houston HIDTA, but those that did felt the increase could be seen in higher drug prices (due to increased violence and tighter security along the border), an increase in human and weapons smuggling, and an increased willingness of DTO members to engage law enforcement personnel with violence to protect their drug loads. With regard to human smuggling in 2010, there were more reports of guides sexually assaulting female illegal immigrants. It was also reported that there has been an increase in illegal criminal immigrants coming through the region, elevating the threat to the Houston HIDTA. There has been concern that the cartel’s increased use of grenades and improvised devices (IEDs) in Mexico may become an emerging trend within the Houston HIDTA, but to date, there have been only isolated occurrences in which drug traffickers have been found with a homemade grenade or IED. Almost half (40%) of Houston HIDTA survey respondents reported an encounter with a major drug cartel in 2010 and most reported the encounter was with a member of Los Zetas or the Gulf Cartel. FBI reporting indicates that Los Zetas and their associates have expanded their influence and operations in Texas. Los Zetas have been found to be associated with drug and weapons trafficking activities in the Houston HIDTA and they have formed working relationships with prison gangs th at are known to be prominent within the region, such as Texas Mexican Mafia and the Houstone Tango Blast. In order to better understand the extent to which Mexican drug cartels and their associates are operating within the Houston HIDTA, the breadth of illicit activities in which they are involved, and to determine their level of connection to gangs within Houston HIDTA communities, the Houston Intelligence Support Center created a regional clearinghouse for cartel intelligence in early 2011. The clearinghouse will collect information from a broad spectrum of law enforcement sources, from routine patrol encounters to complex narcotics investigations. Fifty-eight representatives from eight federal, state, and local law enforcement agencies attended the initial planning meeting for this clearinghouse.